On Sunday, November 26th, New Line Cinema’s “The Nativity Story” will become the first feature film ever to premiere at the Vatican, it was jointly announced today by New Lines President and COO of Worldwide Distribution and Marketing Rolf Mittweg, and Stefano Dammicco, CEO of Eagle Pictures, the film’s Italian distributor. The Nativity Story is scheduled for a December 1, 2006 release in the U.S., and will open in territories worldwide throughout the month of December. 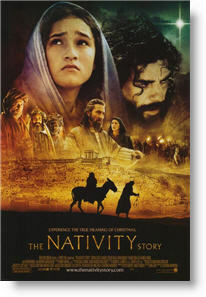 The premiere, to be held at the Vatican’s Aulo Paolo VI (Pope Paul VI Hall), will be attended by “The Nativity Story” director Catherine Hardwicke, actors Shohreh Aghdashloo and Oscar Isaac, producers Marty Bowen and Wyck Godfrey, screenwriter Mike Rich, and 7,000 invited guests of the Vatican. The event will serve as a benefit, with contributions going toward construction of a school in the village of Mughar, Israel which has a diverse population of Christians, Muslims, and Druze and is located approximately 40 kilometers from Nazareth. We are very proud of The Nativity Story and extremely grateful that the Vatican has embraced the film in this way, says Mittweg. We believe it is the perfect venue to present the film’s universal message of hope and faith, a message we are sure will resonate around the world. “The Nativity Story” is an extraordinary event, and this premiere is a fitting way to reach out to our community and share the experience, says Dammicco. It is a privilege for Eagle Pictures to be New Lines Italian partner on the film. The event was made possible due to the collaboration of the Pontifical Council for Culture, the Pontifical Council for Social Communication, the Vatican Film Library, the Pontifical Council Cor Unum (for Human and Christian Development), the Vicariate of Vatican City State, and the Foundation for Sacred Art and Music. Founded almost 40 years ago, the secular New Line Cinema Corporation is said to be the most successful independent film company in the world. Its mission is to produce innovative, popular and profitable entertainment in the best creative environment. In addition to the production, marketing and distribution of theatrical motion pictures, the fully-integrated studio has divisions devoted to home entertainment, television, music, theater, merchandising and an international unit. In 2005, New Line partnered with HBO to form Picturehouse, a new theatrical distribution company to release independent films. A pioneer in franchise filmmaking, New Line’s Oscar-winning “The Lord of the Rings” trilogy is one of the most successful film franchises in history. New Line is a division of Time Warner, Inc. (TWX).